We’ve had Responsive (Display) Ads for a while now. The ad format takes the work out of creating multiple banner sizes, tends to generate higher CTRs, and allows us to easily run on all available GDN (Google Display Network) ad sizes. And very recently, Google updated these ads and formally changed the name to Responsive Display Ads so that we can create more variations, similar to what we can do with the new Responsive Search Ads. 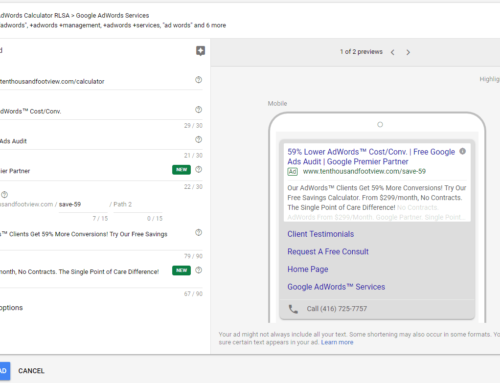 Google automatically selects the content based on the ad size and style where the ad is running. In larger ad formats that would typically mean either a short or long headline, possibly a description, business name, one logo version, one image version, and a call to action. In smaller ad formats, you might only see your headline, logo, and visual representation (arrow) as your call to action. In a text ad placement, you would only see the ad copy elements of your creative. 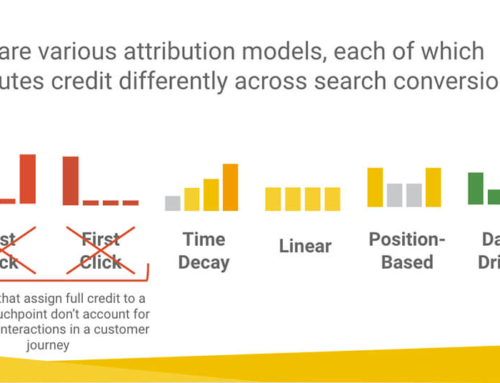 Google automatically optimizes placement frequency based on performance. 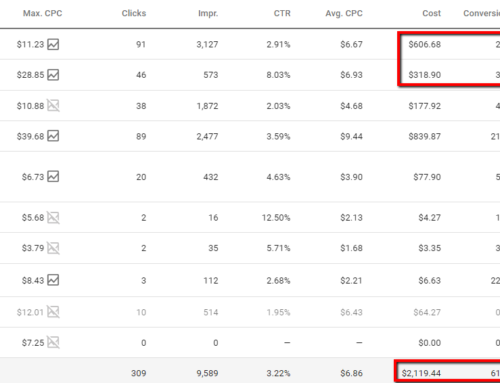 If you are optimizing for clicks, Google would identify the higher CTR ad sizes/types (relative to competition) and run your ads in those formats more often. Similarly, if you’re optimizing for conversions, Google would run high converting ad types more often. While Google’s algorithm will still optimize ad type frequency, Google will also split test ad copy and image variations finding the best combinations. This is a great new tool to boost display ad performance. This can be particularly powerful in combination with some of the new targeting options like custom intent audiences. In addition to support for the GDN, the new format can also run on Gmail placements. This means you can copy RDAs from your display campaigns to your Gmail campaigns, a big time saver! While the new format represents a big upgrade, there are still some gaps. We still don’t have any visibility into which ad sizes and types are driving performance. Nor can we choose which ad sizes we want to run. Some smaller ad sizes contain so little information, the ad is almost useless except for shoving your brand in somebody’s face. Also, unlike RSAs, we can’t yet see which copy/image combinations are performing best. Setting up new Responsive Display Ads is pretty straightforward and not much different from before, except that you have more copy and images to work with. Unlike RSAs, you don’t have to worry about using shorter copy so that more snippets can run at once. As with RSAs, ensure that your ad copy and image variations are distinctly different to take full advantage of Google’s AI. Unfortunately, you cannot convert an existing (older) Responsive Ad into a (newer) Responsive Display Ad. 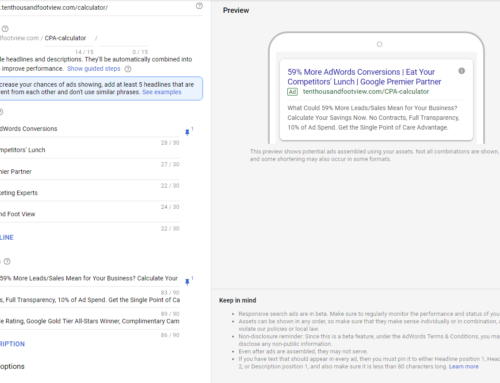 If you have to create a lot of these I recommend either opening two Google Ads tabs so you can quickly copy and paste ad copy, or downloading your existing ads into a spreadsheet. Google will show you the ad strength and asset progress as you develop so you can ensure you’re following ad variations best practices. The ad preview tool has been beefed up a lot. You can now view ads by placement type; display, YouTube, and Gmail options are available. And, within each placement type, you can choose different ad formats, image, text, and native as well as the device type as appropriate. Having the ability to preview many different ad variations is extremely helpful in understanding what your creatives will look like before you launch. This addresses a complaint that many advertisers had about seeing “ugly” ad variations showing up and then regretting their creative choices. 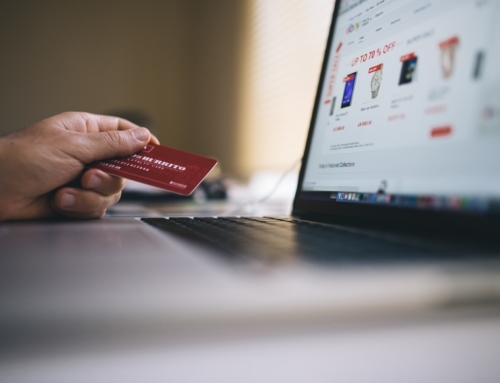 Should you still create banner ads? In a word, yes. At our agency, we still run the most popular ad sizes using traditional banners to split test against RDAs. Banners still provide more creative control and can outperform RDAs in some cases. That said, we are mostly seeing better performance from RDAs; it’s likely that traditional banners’ days are numbered. What’s Next for Responsive Display Ads? Unlike RSAs, the newest version of RDAs are not in beta. This means they are a “finished product.” That doesn’t mean, however, that Google is done with them for now. I fully expect to see some ad variation reports in the near future.